We’ve known some serious varminters who will invest $4,000.00 in a custom rifle, pay thousands more for spotting scope and laser rangefinder, and spend countless hours loading ultra-precise ammo. Yet, when they head off to the prairie dog fields, they’ll omit an essential piece of gear that will make the difference between a hit and a miss. We’re talking about windflags. Many casual shooters, varmint hunters, and even some “tactical” shooters disdain windflags as gadgets suited only for the accuracy-obsessed benchrest crowd. In fact, windflags are just as important for the varminter as for the benchrest competitor. You may think that you can easily notice a major wind shift. But consider this, a change from a light 2.5 mph left breeze to a 2.5 mph right is a 5 mile per hour switch. That is enough to make you miss a prairie dog even at just 200 yards. Here’s a chart that shows the effect of a 5 mph full-value (i.e. 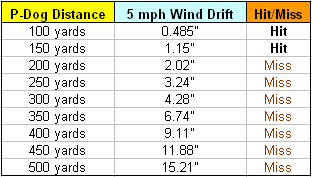 90-degree) wind change at various distances. The values assume a typical .250-BC varmint bullet launched at 3500 fps at a 3″-wide critter (center hold). You don’t need to spend a lot of money on windflags. Even a bit of surveyors’ tape on a post is better than nothing. 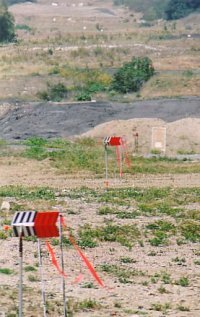 As Forum member Catshooter explains, a simple windflag, placed at your shooting station, helps minimize the effect of cross-winds. If you align your shooting position so the breeze is at your back you can shoot with greater confidence even in high winds. Watch the way the windflag blows, and shoot at the dog mounds that are directly downwind. Windflag photo courtesy Flying Fish Fundamentals, makers of single-and dual-vane wind flags. Share the post "Wind Flags for Varminters"
A very extreme piece of legislation, AB 2062, is now being considered by the California Legislature. This bill, if passed by Assembly and Senate, and signed by the Governor, would impose stringent new limitations on the purchase of handgun ammunition. AB 2062 would also ban internet sales of pistol ammunition (and potentially) ammunition components. Because many popular rifle cartridges (such as .223 Remington) can be chambered in single-shot handguns, this bill could affect rifle shooters as well as handgun owners. Under the proposed legislation, all vendors selling handgun ammunition would need a special handgun ammunition license that would be registered through the California Department of Justice. Pistol ammo buyers would have to obtain a permit, and purchasers would have to submit a thumbprint at the point of purchase that would then be sent to the California Department of Justice to be stored in a database. Finally, all sales of handgun ammunition would have to take place in a face-to-face transaction — no mail orders. In the past, we have seen the California Department of Justice broaden the reach of a new gun regulation law far beyond its express terms. If AB 2062 is adopted, we fear that the DOJ could use this law to ban ammunition reloading components as well as complete, loaded ammo. 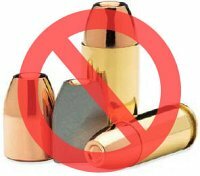 If mail-order brass and primer sales for handguns can be restricted, you can bet that rifle ammo components are next. Let us be clear, however — on its face, AB 2062 does not ban online brass, powder, and primer sales. But we would not put it past the DOJ to try to extend a ban on ammo to the ammunition’s components, particularly bullets. We encourage all California gun owners to contact your local Assembly Member today and urge him or her to oppose AB 2062. The NSSF and the California Assn. of Firearms Retailers (CAFR) are asking individuals to visit their local firearms retailers to add their signature to the opposition petitions for AB 2062. CLICK HERE to download sample Petition. Share the post "California Legislation Threatens to Restrict Ammunition Sales"